This is like welcoming back an old friend…after three long years of empty harvests when we just were not able to collect any of our KATZ Raspberry Flower Honey…we finally have a new batch! Given another drought year and the ongoing issues with honeybees and their habitat, I was not yet expecting the return of the raspberry floral source. But alas we now have gathered enough of this truly extraordinary nectar to offer it for as long as it lasts. Light amber in color, it has that unique floral tone that immediately announces it is gathered from the raspberry flower with hints of fruitiness embedded in the aroma. In flavor, it is truly harmonious and balances pronounced sweetness of the berry with a piquancy that makes for such an appealing 'culinary' offering. For those who know their honey, you understand that it is very rare mono floral honey where you get some of the nuances of the fruit source in the taste, as we do in this case. 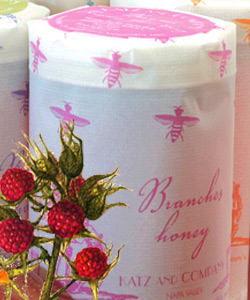 SERVING SUGGESTIONS: This is a delicious baking honey that pairs well with fruit. With biscuits and rolls, certainly a part of many upcoming holiday feasts, why not drizzle over warm for an ethereal treat. We have increasingly been replacing a good percentage of sugar in many recipes with honey and the balanced “sweet and tart” aspects of this offering makes it an ideal 'tool' for such a transition. And, of course, don’t forget to add a bowl to your cheese platters!